Do you have what it takes to win our holiday video contest? Congratulations to Deborah Zordan - Video Contest Winner!! 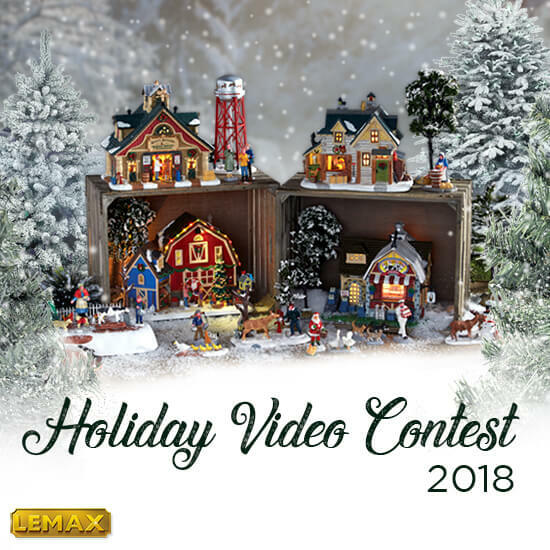 Every year, we receive hundreds of fantastic entries from Lemax collectors who want to show off their incredible holiday villages. This year, the contest is all about creating the most realistic village possible. We’re looking for the most lifelike, immersive holiday village that makes you feel like you’re really in that town. No matter the theme of your village—whether it’s a Victorian theme, a snowy village theme, or even a Santa Claus theme—we’re looking for villages that have a truly authentic feel. Does your village take us back several centuries to the Victorian era? Or does your village make us feel like we need to bundle up for the cold? Does your village have a small-town look and feel? Do whatever it takes to make your video feel like we’re walking through a winter wonderland! That means lots of happy villagers, detailed landscaping, immersive backdrops, and anything else you can do to make your village come to life. To qualify, your village must include a new item from the Lemax 2018 Collection. So make sure that your video strongly showcases one of these new items by zooming in for a second or two! And most importantly of all: have fun! Good luck. How lifelike and engaging is your video. The type of music and theme you selected for your video. Innovation, originality, and inspiration – Your village should be inspiring! Must include a 2018 Holiday Product. Your video must NOT be more than 2 minutes long. Video must be of your own holiday display village. Videos of store displays or other collectors’ displays will be disqualified. All submission must comply with the Contest Entry Rules shown below. Only one (1) entry per person. Double entries will result in disqualification.